Post a picture, tell us how you made it, and any other details you want! How long did it take? How difficult was it? Did you base it off of a character? When you wear it, do you feel like that character? I'll start us off below because mine turned out terribly and the rest of you will feel better about yours! I sort of had my character Amyr (my avatar!) in mind when I made my armor. She's green on black because I'm all about duty and justice. :D I didn't fork over the ten bucks for red spray paint just for the collar piece, though. I'm cheap like that. I literally don't have a full body picture of me wearing my full costume, but here's a picture that was taken during the construction phases. Total construction time: About 20 hours? I got from the cutting stages to the end of the painting stages over the course of four days. It was a speedy job. I HIGHLY recommend the trashcan armor for any guy. It's a really easy way to get armor pieces, and if you paint them right, you can make them look really cool. Here's the TDH link. 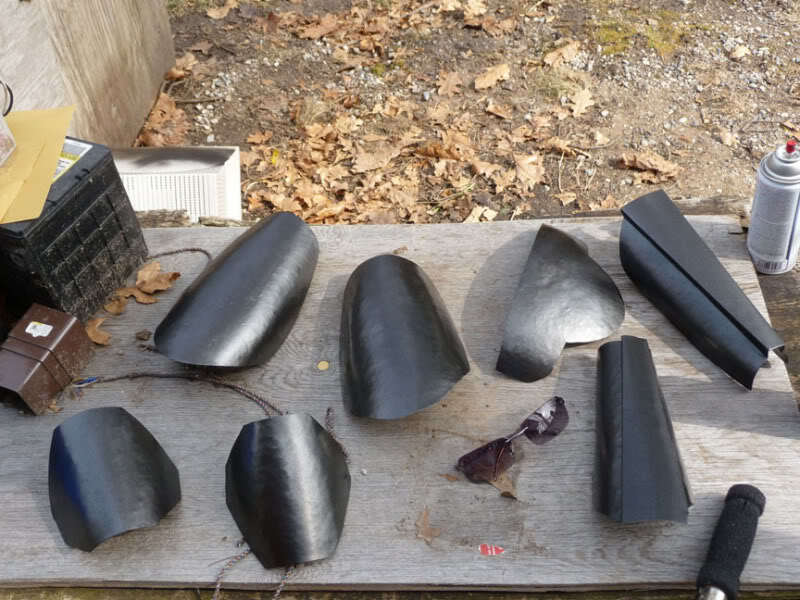 Bad stuff first: For me, the trashcan armor did not work out very well. The pieces didn't conform to my chest at all, so I looked like a beskar'gam pop-up book. I thought wearing the right undergarments, flattening out with the puffy vest and lots of extra velcro would help, but it didn't work. It also made me look like I was 10 pounds heavier. No one wants that! Overall, it was a learning experience. 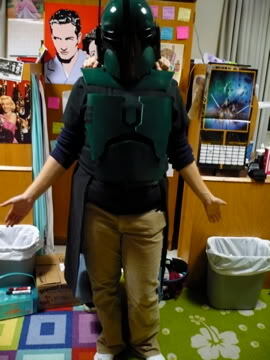 I don't know what kind of alterations I need to make to make the chest pieces work, so for now, it was kind of a bust. But I at least had it done in time for Halloween! Now that you remind me of that actual armor set I figured I should have given that Amyr drawing a regular breastplate to fit your own. your beskar'gam is looking pretty good, I bet its alot easier when you have those trash cans, I had to special order some sintra. Just wanted to post a few images of the suit I made back around Halloween. I had always meant to make one, and I was just dinking around with it for a minute, but when Halloween was coming... well, I wanted to make SOMETHING to wear around that was also awesome! 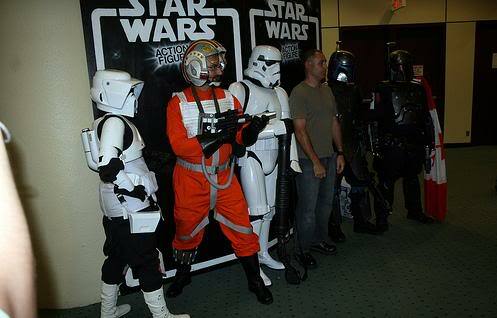 Everything about this costume involved nothing but "first times" for me. I have never before made props/costumes like these! I made the armour plates with those plastic trashcans, the same ones Cat'ika used to make hers. I custom-shaped them by using a small butane torch and gently applying heat and pressure. I used Rub N Buff to silver up the plates to give them a more realistic metallic look, versus just spray painting them, and proceeded to try and use sand paper to rough them up. Didn't go as planned, but hey, I'm still an up-and-learning amateur costume/prop maker. 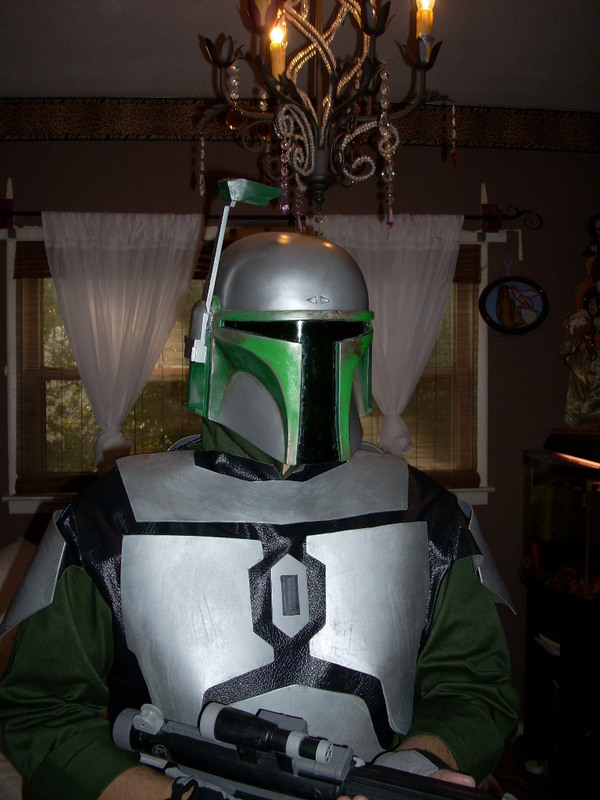 The helmet was a Rubies Jango Deluxe that I rebuffed and repainted, as well as replaced the visor. Yeah, everything was green tinted, but it looks way better than the original did, and it was completely opaque. Well, 95% opaque, anyways. The blaster is just a Stormtrooper Hasbro toy I got for $15, and the jumpsuit was one I got from Sportsmans Guide for about $20. Unfortunately, the weakest part of the costume was the vest, which I use vinyl for but I cobbled together really quickly with glue (because I can't sew). It lasted the night, but was falling apart by the end. Ah well. My baby's not done yet, but she's hammered metal. Been working on it for a long time now. How do you intend to attach it? I have aluminium armour and I was thinking of two different ways of doing the same thing. Then screw nuts to the bolts with the flak jacket in-between the two. Not too long, but yeah, compared to some other methods, it takes some patience to dish and planish every piece. I enjoy it, though. Making a metal helmet is a bit (a lot) beyond my skills, so no, that will be a Rubies for the time being. As for attaching it, I'm still debating; that's kind of why I haven't worked on it for a while. My jumpsuit is skin tight Lycra/Nylon (I might be buying a different one that can take me punching holes in it for snaps), so that'll have to be a combination of velcro and belts and such. As for any pieces touching the vest, I also don't know yet. Either using eyelets and supergluing the bolts onto the armor, or snaps. I'll be taking the issue to the Mercs forum when the time comes, I figure. I like the design of the armor to suite your um... Female figure, most designs Ives seen really exaggerate the chest area, some to a crazy degree. In a more practical situation you design would make alot more sense. It's mostly known as the 't-shirt' design to female Mando costumers, and I'm actually not the first one to use it, but it's always been my favorite. 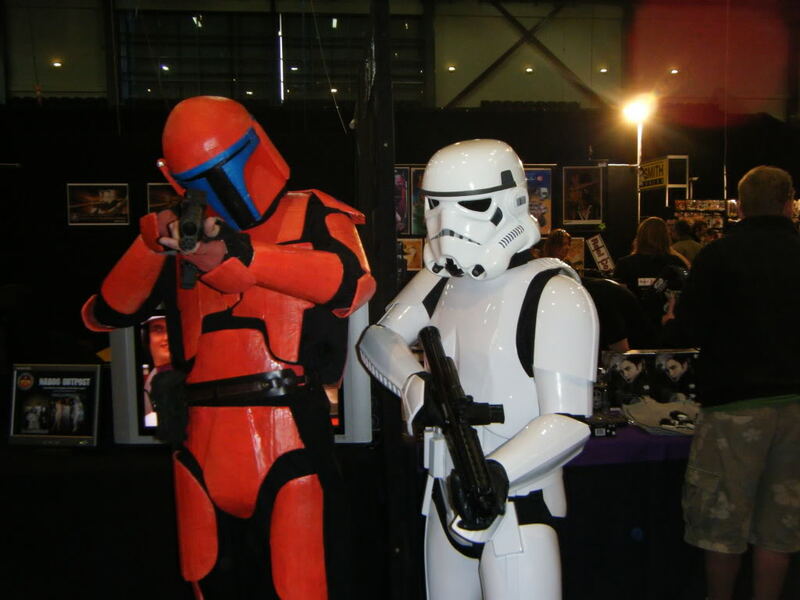 Yeah, the exaggerated chest area of some other femmandos rub me the wrong way; they don't seem pragmatic enough. 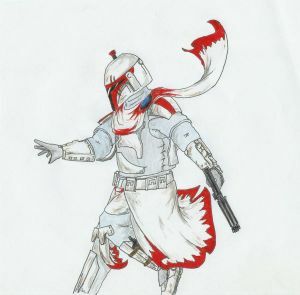 Planet/System : Depends on the season; mostly Mandalore? I'm too lazy to copy and paste some image code, so click on that and you can see all of the pictures, and all the WIP pictures, for my blue armor. It's pretty sweet, I must say. Now, for my "Original" armor. This set took quite a bit longer to put together to wear, because it was my first costume. The blue armor was put together so fast because I used left over metal I had from my V2 version of my red armor, and because I reused most of my soft parts. The character's name is Naas Atiniir, which is the name I go by on the internet now, as I'm quite fond of it. The red armor needs some work, and I need to purchase a second helmet so that I can recomplete this armor. 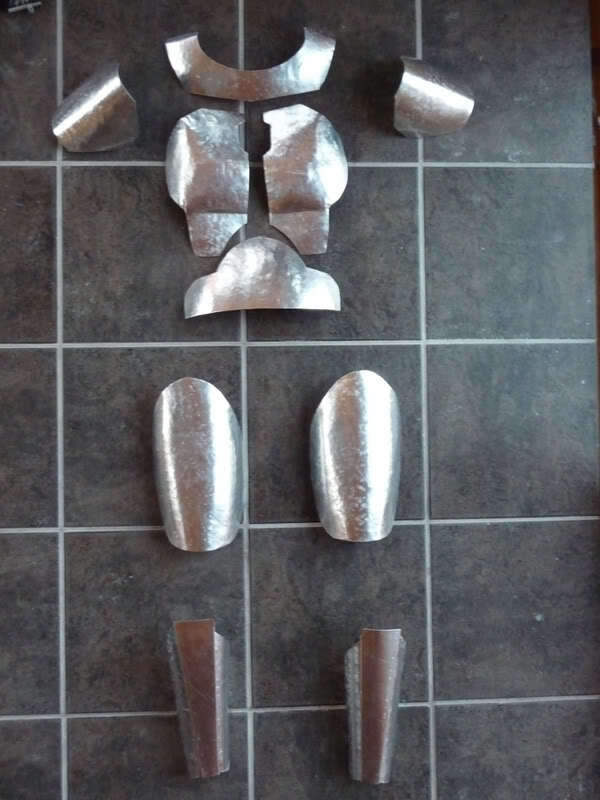 I also want to rework/reshape some (or all) of the armor plates to make them look better. The V2 version of Naas was a little rushed, and I probably could've taken more time and made it better. Now I get to ravage the paint job while I reshape it. I'll be updating the blue armor set soon, and when I do I'll create a special tapic just for that set. 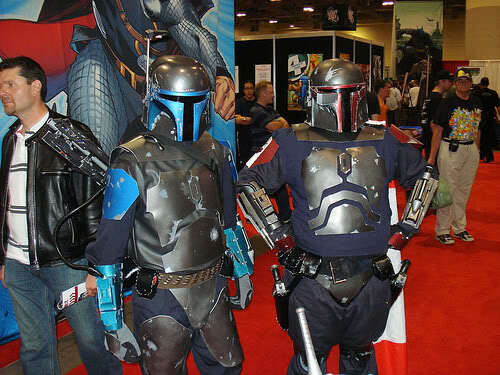 Yeah, the exaggerated chest area of some other femmandos rub me the wrong way; they don't seem pragmatic enough. This is my v1 armour! Go easy on the crits as it is only made from corrogated cardboard and paper mache. I started making it half way through reading TZ and didn't find the costuming comunities until after completing it. 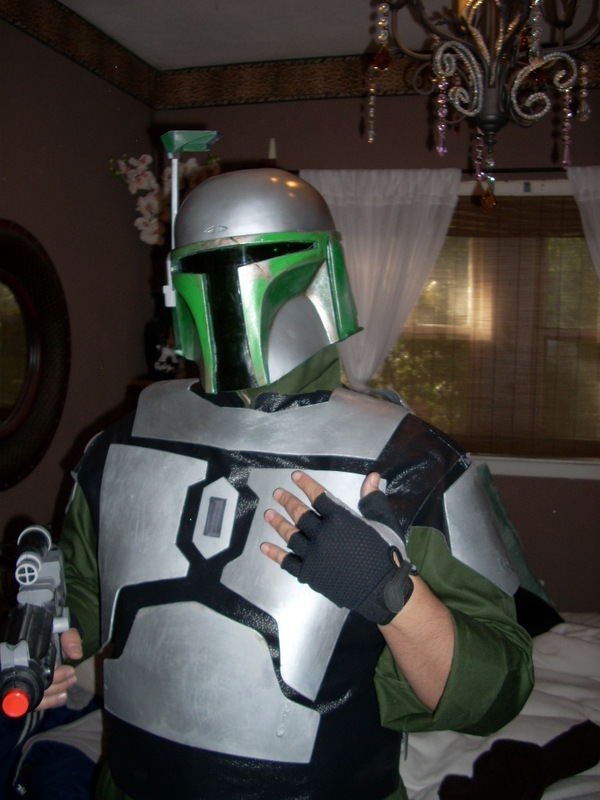 My beskar'gam of my original character, Eyayah Skirata, while I was down at MisCon in Missoula, Montana. Despite that and cooking to death, I had fun. My prop is a Wal-Mart DC-15s that I repainted to make look realistic. this is us being filmed for the "Girls go Geek" show that should be on the Xbox live around now.